When someone asks you to point to your hamstring, almost everyone can correctly identify it on their body. Did you know that the “hamstring” isn’t just one muscle, but rather a group of muscles? And what exactly does this muscle group do, when it comes to training performance? The muscles in your hamstrings are directly tied to the movements in your lower back, pelvis, hips and legs, so it is imperative that you focus on stretching and strengthening them. These muscles are more prone to various injuries that can keep you out of the studio much longer than you’d prefer. 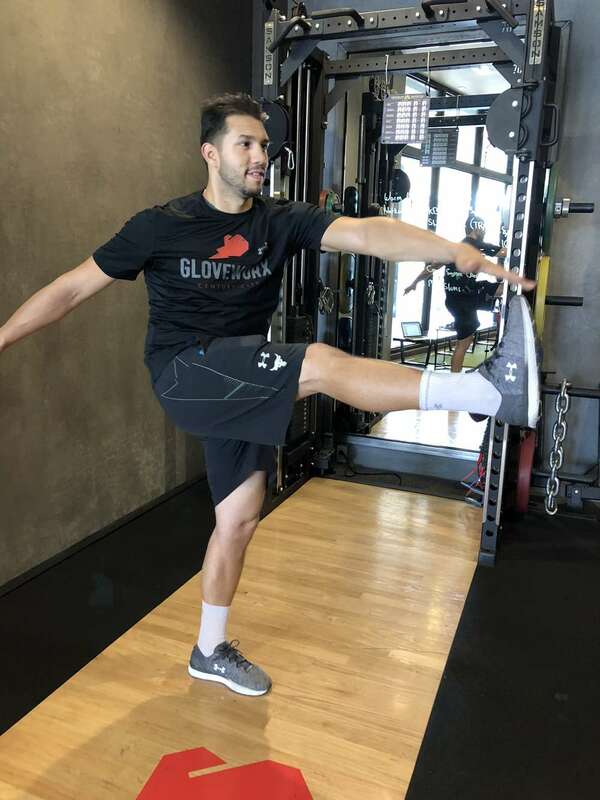 At every Gloveworx session, we devote time to stretching contenders’ muscles in a way that allows them to maximize their ability to train and properly recover. That includes a variety of exercises to properly stretch and condition your hamstring for optimal use. 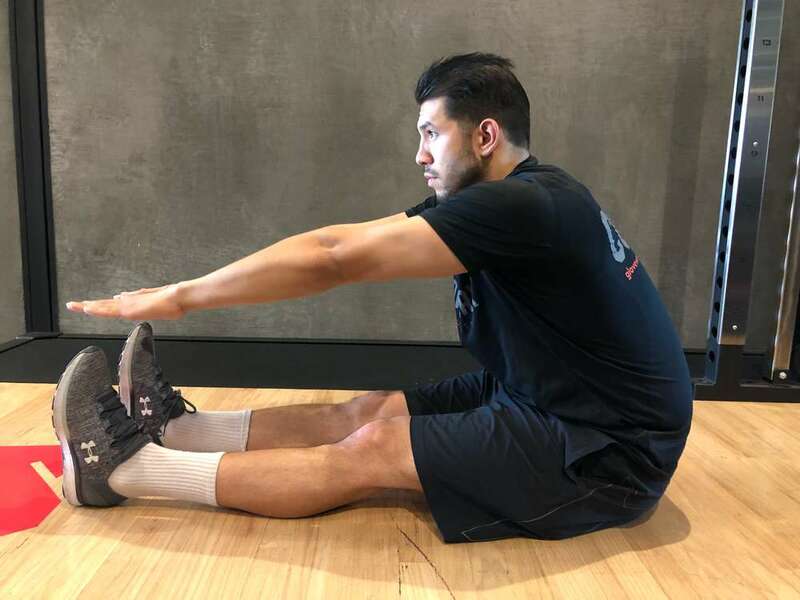 If you're looking for some other stretching exercises to focus on improving the flexibility and range of motion in your hamstrings, we also wanted to provide you with five of our favorite stretches for you to try. Your hamstrings are made up of three muscles, called the Semitendinosus, Semimembranosus and Biceps femoris. All three of those muscles start at your pelvis (hip bone), and run all the way down the back of the upper leg, connecting to the top of your tibia and fibula (the bones right below your knee). The importance of this muscle group should be rather obvious: they not only facilitate the range of motion where your legs connect to your hip, but also play an integral part of allowing you to bend your knees. Think of your hamstrings as the "need for speed" muscles of your lower body. They're the muscles that are engaged when you want to make explosive movements like sprinting or jumping, but they're also the "brake pads" for your body, as they're integral for helping you slow down or stop those explosive movements. As these muscles are involved in moving a large amount of mass (i.e., your body) in a fast, explosive manner, they're very susceptible to injury when they're suddenly challenged in a way that overloads their capacity to work at that given moment. Think about the strain on this admittedly difficult group of muscles in a situation where you've been sitting in a chair for a few hours, and then are asked to sprint full speed in a given direction. Those muscles are totally relaxed and aren’t ready to work, and then all of a sudden, are asked to work at peak capacity; that's just asking for something bad to happen. Anyone who's ever "pulled" their hamstring can empathize with this miserable sensation. It's that sharp pain you'll feel on the back of your leg, usually right around where your leg meets your buttocks. Most hamstring injuries are a result of straining the area where the muscles in the hamstring meet the tendons that connect your leg muscles to your hip muscles. Depending on the severity of the injury, it can often make even the most basic of movements -- like walking -- an absolute nightmare. Even in those cases of a minor strain, you might not feel it when you're moving around normally, but the minute you try to activate any of your hamstring muscles, you'll instantly experience debilitating pain. Most people understand why it's important to stretch, but don't realize why that's the case, especially when it comes to your hamstrings. When you stretch your muscles before and after a workout, you're ensuring they remain strong, healthy, and most importantly, flexible. While some people might tell you that stretching is a waste of time, they couldn't be more wrong. Without a proper stretching routine as part of your workout regimen, your muscles shorten and tighten up, thereby making you susceptible to injuries (like the aforementioned hamstring injuries). Conversely, muscles that have been properly conditioned through stretching remain leaner and more flexible, meaning that any sudden movement won't exert an amount of force that the muscle can't handle. Tight hamstrings can contribute to pain and instability in your knees, pelvis, and lumbar spine. The body is a complex machine. For it to operate at optimal levels, you need to ensure that you lengthen and strengthen all the connecting bits and pieces, from your big toe to your shoulders. Before deciding on the best hamstring stretch to lengthen and strengthen your muscles, there's note of caution to consider before performing any of these: your hamstring is a very delicate muscle group, so you want to ensure that you find that balance between getting a good stretch and stretching the muscle too hard. It’s very important that you err towards the former, as the latter can do more harm than good. 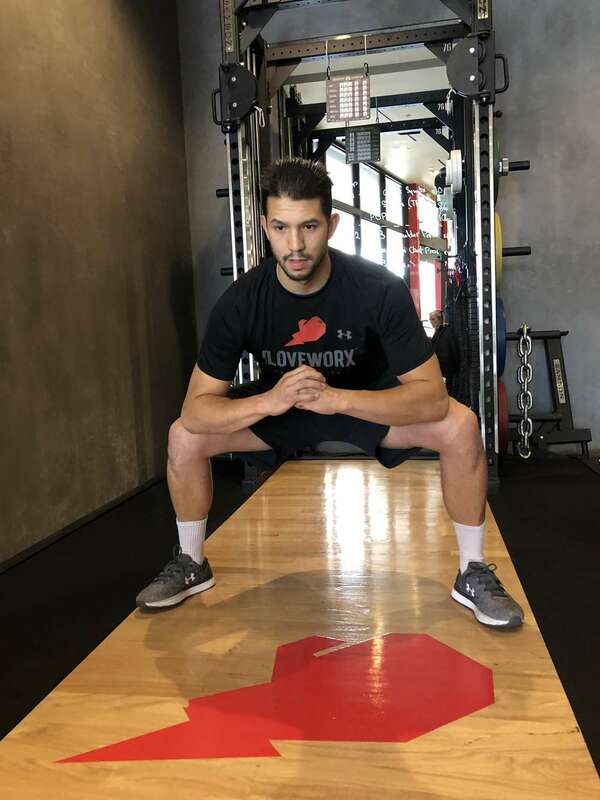 Gloveworx Coach Cesar Rocha shares the best hamstring stretches below. We take the classic sit on the floor and touch your toes style exercise for granted, but it might be the easiest and most effective way to get a solid stretch for your hamstrings. Simply sit on the floor, and extend your legs out in front of you, while maintaining a neutral spine. Reach forward to touch your toes. You want to make sure you maintain a straight leg form as much as possible, with your knees remaining totally straight and firmly affixed to the ground. This one is based on another classic stretch, but with a slight variation that provides more focus on stretching the hamstring. Sit on the floor, extending one straight leg forward, with your knee remaining totally extended and firmly affixed to the ground. Tuck your other leg in, such that the bottom of your foot is touching the inside of the thigh of your straight leg. Lower your torso forward toward your extended leg, with your arms out in front of you. Your objective is trying to have your chest touch your extended leg, as opposed to trying to touch your toes. It may take a few rounds of this stretch to achieve full extension if you have tight hamstring muscles. Start by aiming for your big toe, with the goal of being able to firmly grasp your foot with all of your fingers. Here’s yet another classic “touch your toes” exercise, with a bit of a twist, that provides a great way to lengthen and strengthen your tight hamstrings. Stand straight up, and cross one leg over the other, balancing on one foot. Stabilize yourself on a wall if you have poor balance. Gently lower your torso, and reach for your foot. Try to touch your toes, while feeling the stretch in your hamstring area. Feel free to slowly stand back upright, switch from your left foot to your right foot or vice versa, and repeat the exercise. 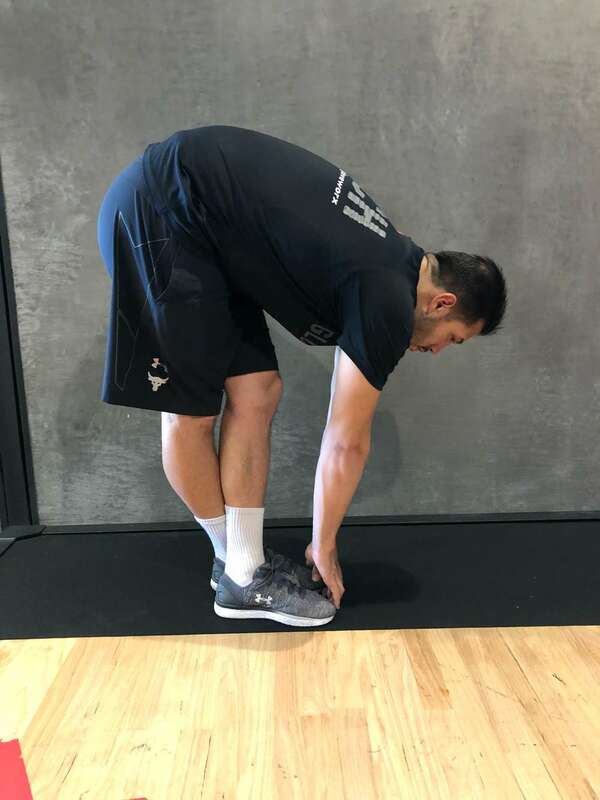 While you might feel a little bit like one of The Rockettes from the famous Radio City Music Hall, this dynamic standing hamstring stretch not only stretches your hamstrings, but also helps with your overall hip mobility. Stand upright, and stretch one of your hands out in front of you parallel to the ground (or ideally a few inches up from parallel, toward the ceiling). Swing your opposite leg forward in a kicking motion, while ensuring your knee does not bend and your leg remains fully straight when you swing your leg upwards. As you swing your leg upward, your goal is to try and have your toes touch your outstretched hand; it’s ok if it falls short. As you swing your leg upward, concentrate on swinging it just high enough to where you engage your hamstring muscle. Bring your leg back down, bring your outstretched arm back to your side. Then, do the same with your opposite arm and opposite leg. Try and go back and forth, switching arms and legs for at least five repetitions of each leg. It's important to note that you shouldn't feel any pain while doing this exercise. Don't push yourself into over-extension. While “The Butterfly” might seem like your classic squat exercise, switching the position of your toes will better engage and stretch your hamstrings. Spread your legs slightly wider than shoulder-width apart with your toes pointed outwards and away from your body. Your big toe should be in alignment with your knees if possible. Assume a “squat” position: with your back remaining straight, lower your torso like you’re performing a squat. You ultimately want to get your legs into a position where your thighs are totally parallel to the floor. Push your body back up “through” your heels, back into your starting position. Repeat that exercise for five to 10 repetitions. A lot of the major lower body exercises are dominated by the quadriceps, resulting in a focus on stretching the quadriceps over the hamstrings. Remember, everything is connected and balance is the key to Becoming Unstoppable in your training. Take some time to strengthen your hamstrings for better lower body power. In addition to stretching when your hamstrings are tight, consider using self myofacial release (SMFR) to massage your trigger points and lengthen your muscles. While using a foam roller for periods of time isn't as effective as dynamic stretching before a workout or static stretching after, it can help when used in conjunction with stretching and strengthening workouts. If you have tight hamstrings as a result of an injury, work with a physical therapist to find the best hamstring stretches that will help you heal rather than aggravating the area. A skilled physical therapist will also be able to determine if your tight hamstring muscles are a result of an underlying issue that needs to be corrected, such as a posterior pelvic tilt or a lack of mobility in your heel and foot area. As with any other muscle group, the importance of stretching these muscles before and after any training session can't be understated. The hamstring can very easily be injured, leading to a very unpleasant experience. One thing to keep in mind is that, even on the days you don't make it to a Gloveworx session, or during your rest days, spending anywhere from 10 to 30 minutes stretching out your muscles each day can do wonders for protecting your muscles from strains and pulls that will prevent you from training. While that may seem like a time commitment, there are plenty of ways to find a small pocket of time to do this -- whether it’s a quick stretch right when you wake up in the morning and before you go to bed, or even performing a few stretches during commercial breaks while watching television. If you happen to miss a day here or there, don’t worry; the next time you make it into a Gloveworx session, our coaches will walk you through a variety of exercises and stretches that will leave those muscles feeling stronger and better.